Mods/Notes: Well, since this is an original design there haven’t been any modifications, yet. 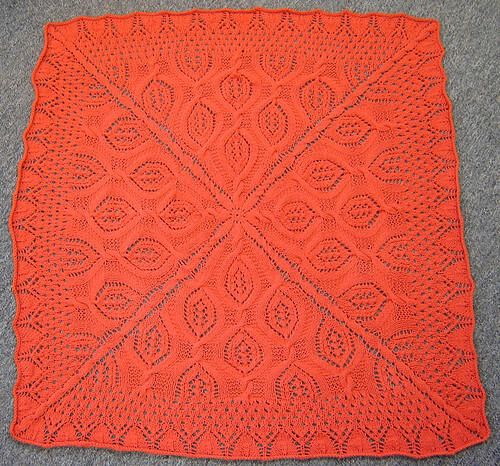 This is a square baby blanket combining cables and lace, knit from the center out with cabled corner spines and a slightly scalloped edge. Would it be vain of me to say I really enjoyed knitting my own pattern? Well then, bring me my magic mirror, cuz knitting enjoyment factor for me? Pretty damned high. Like, “beyond the rim” high. Among other things, I cabled without cable needles for the first time ever! And constantly, as in, unless it’s a seven-or-more-stitch cable, I don’t need no stinkin’ needle! Many an hour of my commute was happily spent intensely conjuring the engineering of this blanket; which elements to introduce and where, what kind of edging did I want? How was I going to build the stitch count while a la Veronik Avery, working the newly-added stitches directly into the cable & lace motif. And how to best achieve the overall look I was wanting in the simplest yet most engaging way possible; and how to put it all down on paper in such a way that other people besides me can understand it. The only issue I have with this pattern is that you can’t add more repeats of the cable & lace motif than what the pattern calls for unless you’re prepared to do some serious slap-dashery and number-fiddling. I tried, but to write it all down in the pattern made my brain all ‘splodey. Besides, at 42″ x 42″ I don’t see much need for it to be any larger, unless you’re wanting to use a finer-gauge. 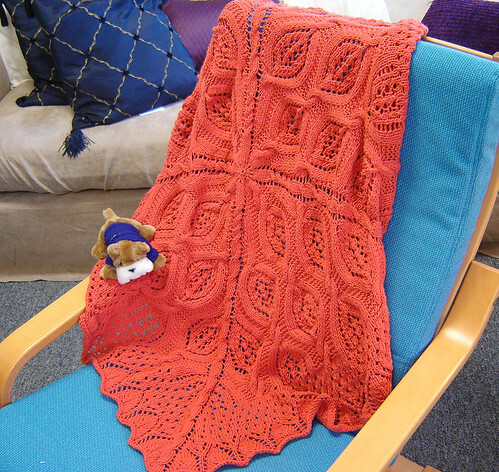 I seriously considered taking Turtlegirl’s threat advice, and thought about submitting it to IK, Magknits or Knitty, but I really didn’t want to have to sit on the pattern and the pictures until February (and I’m still mad a Knitty for the last rejection). And even though I’ve been threatened about giving the pattern away (busted kneecaps…okay, I might be exaggerating a might), I can’t bring myself to charge money for it. That’s not what we’re about. So, if you’re interested, there are 3 ways to obtain this pattern. 1. Click the Big Damn Button. 2. Find it in the Dizzy Blonde Designs page. I’m rather curious to see this knit up in something other than cotton. So, if you knit it, let me know. JenLa » FOs, Yarn and Contests, oh my! 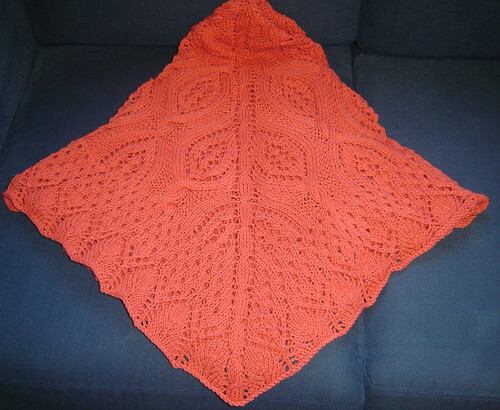 I like the color and the design is very pretty, i love this baby blanket.